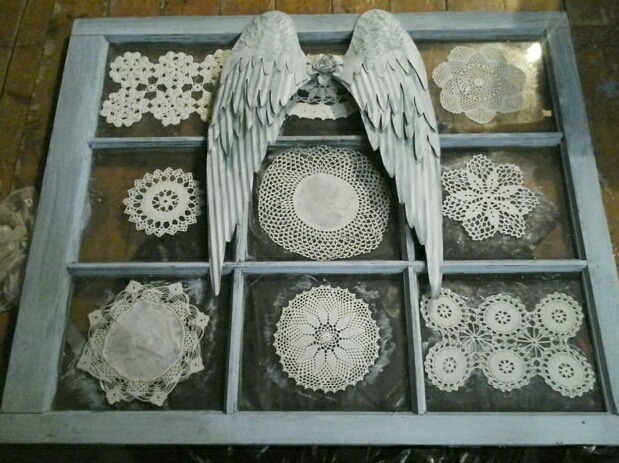 I purchased these beautiful wings from https://www.etsy.com/shop/sissiecakes?ref=em a while back, with the plan for them to be available for rent. I just love them and I have ideas for a couple different ways they could b used for events and photo shoots. They are 33 in. tall so not a tiny difficult item to photograph. They are metal and painted icy blue and white, with a flower in the middle of metal and crystals, just gorgeous! I still have a couple of windows and wanted to use one for a back drop. 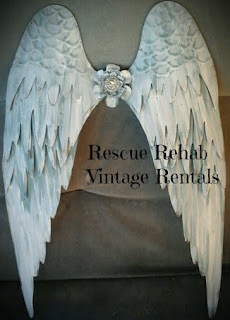 The wings have tabs on the back and are easy to hang in different ways. I will also be able to hang them on our church door that we have for rent. 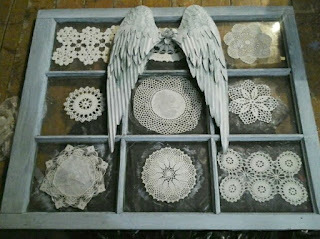 This window has some cracked panes and I wanted to use lace to cover them. The piece of lace didn't work out, so I used Mod Podge and attached doilies instead. If you are local and would like to rent these for your event or photo shoot, feel free to message me on our Facebook page https://www.facebook.com/Rescue-Rehab-Vintage-Rentals-1620380771560046/ I did try to build a website for the rental company, but so far have not been very successful .....yes, I am tech challenged! 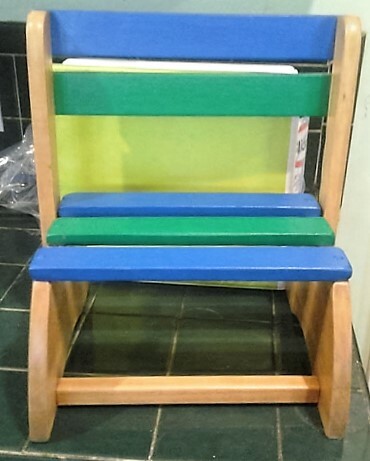 Sit down, or step up! I was asked to give this little vintage step stool/chair a make-over. These are classic, kids love them, and I think every household has had one. This one still had vintage stickers on it, but they were more dated than the owner wanted. 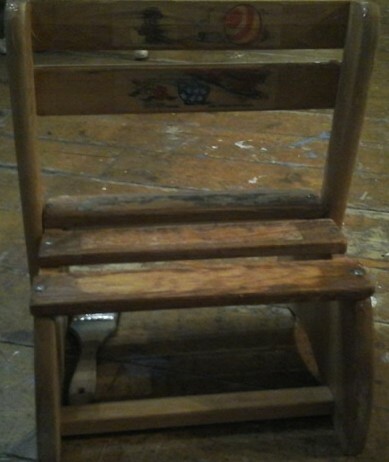 It needed some tightening, cleaning, and refinishing and I was happy to work on it. In this picture it looks a little rougher than it was, it has stripper on it and the lighting isn't very good. I hope the little guy who owns this and his grandma will be happy with the make-over, I won't be able to deliver until next week. I hope you are not tired of the mahogany pieces that I have been so lucky to redo! I never tire of them. They are so classy and classic, and I love the deep reddish color on most of the pieces. I showed up over an hour early to a barn sale on a very cold, snowy morning early in September to try and snag some of the mahogany furniture that had been advertised. 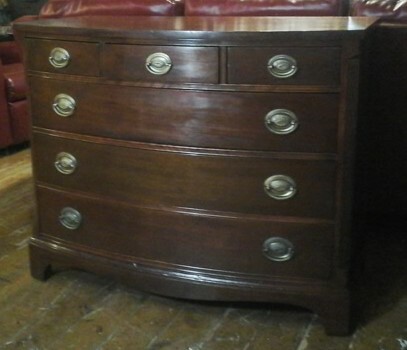 I got lucky and was able to acquire this dresser, a buffet and two end tables. 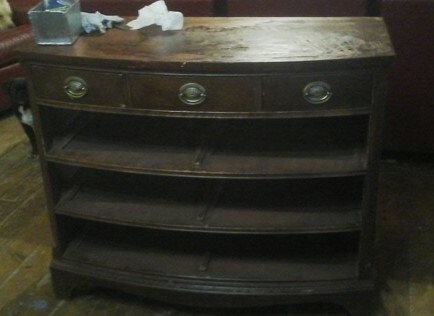 I narrowly beat one of my good customers to the sale, and when she saw the dresser she made it clear that she had dibs on it when I finished it! I have really enjoyed redoing some really nice furniture for Jesse and Duane. They really appreciate the quality of these sturdy older pieces and even though they will be moving in the not too distant future, they intend to take their furniture with them. I always start these project by cleaning them up and taking off the hardware. The next step is to assess and fix any damage. One of the drawers had a loose runner that needed the screw put back into it in the back. There were lots of bumps, bruises and scratches on the finish. My goal is not to make the piece look brand new, I just want to minimize the damage without removing the character. With this dresser, I used Minwax Wood Putty in Mahogany to smooth out some of the deeper dings in the finish. 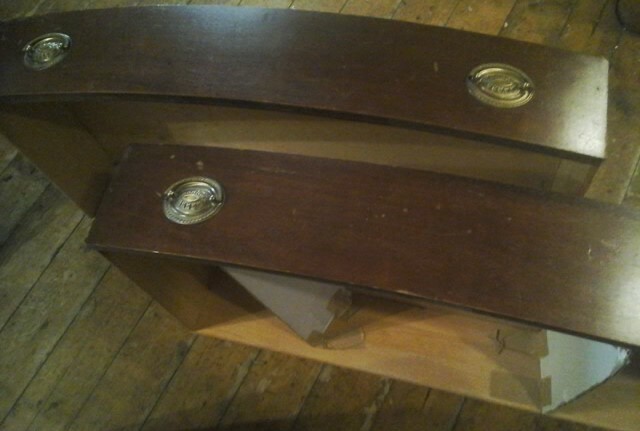 It is already mahogany colored and matches well. How much damage the finish has over all will affect what fix I use for the rest of it. I have had very good luck with Minwax Gel Stain. If the finish is not too bad, it is possible to do a light sanding followed by the Gel Stain, without completely sanding the piece down. I have found you must do small areas at a time, applying the stain and pretty strictly adhering to the 3 minute rule before wiping the stain off. It will get sticky and very difficult to remove if left on too long. I usually do at least 3 coats, each one at least a day apart to allow for adequate drying time. With this dresser, and many others I have done, the top has gotten the hardest wear. 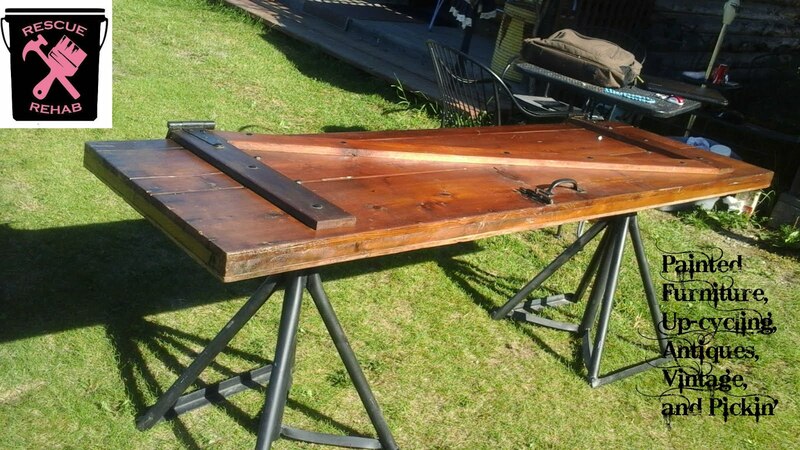 In that case, I usually apply a stripper then sand down completely to start the staining process from scratch. With mahogany I have found many times that once you begin staining some lighter areas appear, which I assume must come from some previous damage. I have had good luck with rubbing a very small amount of Van Dyke brown paint over the area to help blend the color. Keep in mind to only use a very small amount! I follow up with at least 3 coats of Polyurethane, also each at least one day apart. I am looking forward to delivering this dresser on Saturday! Please excuse the shadowing on the drawers, our lighting in the winter is awful!